Many times I make the parallelism between Arca-Swiss® compatible components and the LEGO® system. With LEGO as long as you have the right bricks you can build whatever you like. This sturdy and versatile flash bracket idea comes to verify my claim that also with Arca style components only imagination is the limit. The idea belongs to T.S. a Hejnar Photo gear fan, who likes to share with us but prefers to remain anonymous. He put the components together for his studio portrait setup. I've been looking around for a flash bracket for some time, but nothing on the market seemed to have what I wanted. Most flash brackets on the market are intended to be hand-held for event shooting, and involve some kind of flip action when the the camera is in portrait (vertical) position with the flash off at some angle. I always set up my camera in portrait (vertical) position, and use speedlights with radio controllers, so I use a Nikon SU-800 to control the speedlights with Nikon CLS. I like to have a small LED light on the bracket when the light is low to help focus and keep people from crashing around in the dark. Sometimes I put a flash up beside the SU-800 rather than the LED light. Anyway, this set up works very well for me, really solid and stable. I use the same bracket set up for macro work too. Not sure if this configuration would be useful for others. Hejnar E030-80 8" nodal slide rail with F61b clamp repositioned 90 degrees. This nodal rail is fastened to the rail on the L-bracket used to attach to the base of the camera. 2 x Hejnar F69b 1.50 " clamps attached to vertical rail to support SU-800 and LED light. I used these clamps because they had two screw mounting and are very secure on the rail. Note that I used the nodal rail and vertical rail from the SCV 8" panorama package. * A guy can never have too many rails and clamps! I should also mention that I do use the same parts when my camera is in a horizontal position, just with the nodal rail attached to the short side of the L-bracket, and the vertical rail attached to the nodal rail, all on the left side of the camera as seen from behind the camera, rather than the right side when the camera is in the vertical position. *Coming from the Create a Multi Row Panorama Head Ver. II article. I hope you found the idea useful, thank you for viewing. Flash bracket Photos © 2014 all rights reserved. Current price for the ND600 L Bracket is US$ 90.00 (No longer available). 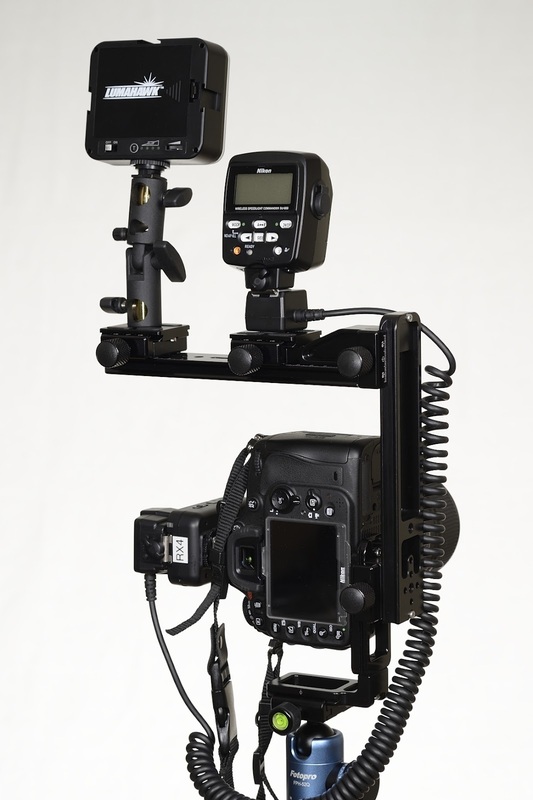 For the E030-80 Nodal + F61b Clamp combo is also US$ 90.00, while the VR80 Vertical Rail assembly rises to US$ 110.00. Each F69b 1.5" clamp costs US$ 45.00. All components are available from the Hejnar Photo online store.